When Skeeter graduates from college in the early 1960's, she returns home to Jackson, Mississippi. Her friends are all married and having children, while she is a single aspiring writer. Her sorrow over the loss of her childhood maid, who left town while Skeeter was in college, and her desire to become a professional writer propel Skeeter to a project that will affect the lives of most of the women in her town. This is an incredible debut from Kathryn Stockett. Written from three different perspectives, in three different voices, the novel follows Skeeter and two maids - Aibileen and Milly - as they come together to tell the true stories about the relationships and interactions between the help and the white women for whom they work. Stockett does an amazing job of developing each of the many female characters in this novel. Although all of the women fall within two categories - the help and the white employers - each is unique so it's easy to keep track of them, their families and their storylines from beginning to end. It's an excellent look at how life was for these Southern women as they embarked on the changes that the civil rights movement would eventually bring to all of them. 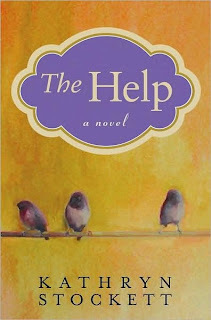 This review was written based on a copy of The Help that I purchased. I loved this book, too. Wasn't it good? It seems like it would be a fun one to discuss in a book group. I'm actually hosting my book club's discussion of this one in January! This one is in my TBR pile. Can't wait to start it as I have heard really good things about it. Thanks for the review. I couldn't wait to finish this book so I could send it to my mother. I wished the author had written more because I would have bought every one. I have been telling every person who will listen to buy this book. I fell in love with those three women. I wished I could have hugged them myself. Thank you, dear author, for writing such rich characters who spent time with me.